To those loyal readers who have kept checking back for another post while this blog has been neglected for two and a half months, thank you! I even missed my three year blogiversary last month. I could say that I was having a hard time topping the last post featuring my daughter. But the real reasons for the neglect are 1) I started a new job last March that requires travel almost every week (which I will elaborate on in a future post), and 2) I got on Facebook. Soon after signing on, I realized that I am at least ten times more likely to get a comment from anything that I post on FB than I am here. And since I am a blatant comment whore, well, you can see why FB has lured me away from the blog. I have missed it, though, so thanks for your gentle nudging back to it. When we last checked, Jessica had turned 21. She asked me about a year ago if I would take her to Las Vegas for her 21st birthday and I was happy to oblige. We went over Labor Day weekend. To those of you who have followed this blog from the start, you may remember my first November 4th post was about my dad, and how I met him in Las Vegas on Labor Day weekend. This past Labor Day marked the 25th anniversary of that meeting. Sadly, this trip we had to visit him at the cemetary, but it turned out to be a very nice visit. We hadn't seen his headstone, it has a cowboy hat on it. We sat down in the grass and told Grandpa stories and we could almost feel him laughing with us. Other than that, we did the usual Vegas stuff, played some slots, went to a fancy restaurant, looked at the shops in Caesars Palace and Bellagio, saw the water show, visited the grand canal at the Venicia. That is a key lime pie martini with graham cracker crust on the rim of the glass. To die for! We had to go to Hoover Dam. 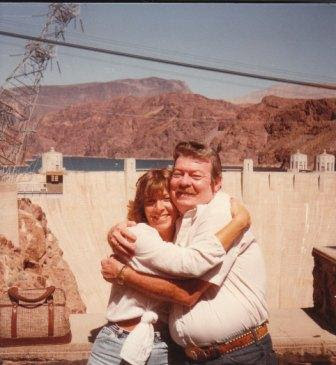 Full circle, that's me and Dad 25 years ago at Hoover Dam. We stayed at the Luxor, the pyramid shaped hotel/casino. Because of the interesting shape, the elevator goes up and sort of sideways. They don't even call it an elevator, it's an inclinator. The evening we boarded along with several very loud, inebriated young women, it was quite amusing watching them try to stay upright. We took this picture of the Hard Rock Cafe for my son, the guitarist. Figured he would appreciate the huge axe. He pointed out that the G string was missing. And, of course, we had to have a picture in front of the famous sign. All in all, a wonderful weekend with my daughter. I have to say I am honored that my 21 year old wants to spend a long weekend in Vegas with me! Such wonderful memories for you and Jess. By God you are a beautiful lady--love that pic of you and your Daddy. Hey, that inclinator was hard to remain upright in sober...try it drunk and in 5" heels! Those girls should be given awards. And of course I wanted to spend my 21st with my mom! We had a BLAST!! randy - thank you, I'm assuming you mean me and our daughter! mary - I love that pic, also. We were so happy to have met one another and I think it shows. I finally had a daddy. jess - Yeah, maybe they should do some Olympic standing in five inch heels in the inclinator thing. Yeah, we did have a great time, I will remember it always. You are such an awesome person to spend time with! Welcome back! Of course, I have been following you on Facebook, so I knew about the Vegas trip, but I enjoyed reading about it again. I am sure you had a vacation that you both will never forget. It really is awesome that Jess wanted to spend her 21st birthday with you. Don't wait so long to write again! Looks like you guys had a great time. What a wonderful trip. I have been missing your blogs! Lois and I both missed your blogs. What a pleasant suprise to see you are back with such a nice warm story. di, tracy and bill - Thanks, it's nice to be missed! I forgot to say in the post that one of the highlights of the trip was seeing the LOVE (Beatles) Cirque de Soleil, it was amazing! I see Bill already said what I was going to say---that I checked your blog every day, and there was never anything new. Just now I sat down to e-mail you, and ask what was up, and decided to check, just to be sure! And there you were--telling about your wonderful week-end. Lucky you--to have such a wonderful daughter!!! Love you both!! lois - Yes, I am very blessed. Thank you for being so loyal, I will try not to neglect the blog in the future!